As an early childhood teacher of many years and a student of cognitive psychology, this picture makes me more than a little nervous. 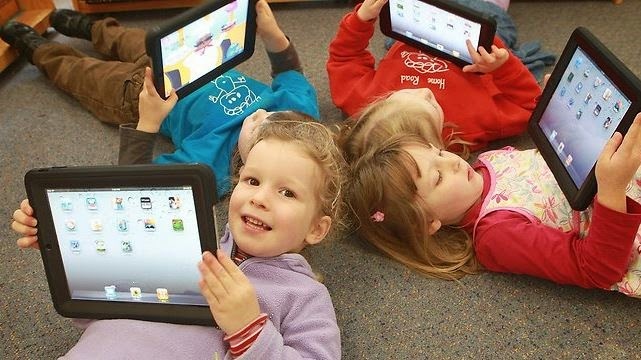 It is not so much what the children are doing - technology is a part of our world and they are exploring and learning. What bothers me is what they are NOT doing. They are not moving around, they are not breathing fresh air and integrating sensory information, they are not talking, they are not playing with each other. All of these activities are essential for healthy development and learning. It is interesting to note that when Steve Jobs, founder of Apple, was asked how his children liked the iPad he responded: "They haven't used it. We limit how much technology our kids use at home." I am not one of those who believe that technology ruins brain development. I believe that technology encourages a different kind of development. I am not one of those who believe that technology stifles creativity. I believe technology can inspire as much creativity as crayons and paint - you just need to find apps that give the equivalent of a blank piece of paper instead of a coloring book page with lines. However, I do know that God's plan for how children learn has not changed because we have developed technology for even the youngest among us to use. Children still need to talk, to run around, to create things with found objects, to imagine they are someone else. They need to sing, shout, and argue. They need to make mistakes and get into trouble. They need to problem solve and learn to get past failure. Technology is great, but don't let it replace childhood.